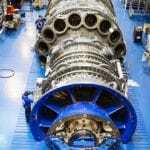 Increasing plant efficiency and reducing maintenance costs is important for economic power plant operation. 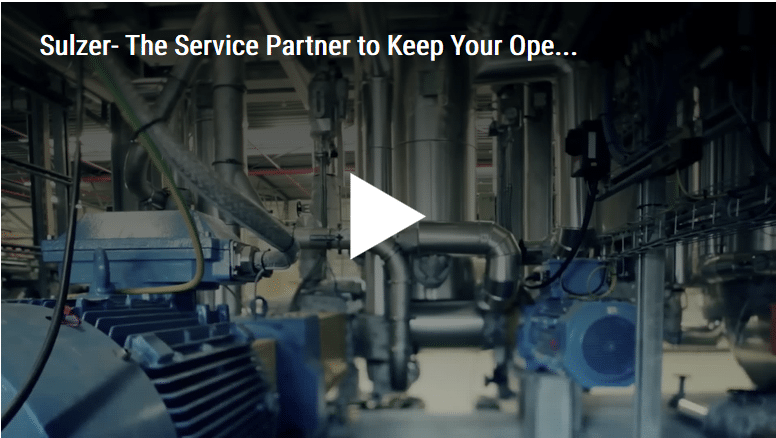 One part of the task involves keeping the boiler heating surfaces as clean as possible, which increases heat transfer, reduces maintenance, and avoids unplanned standstills of the plant. 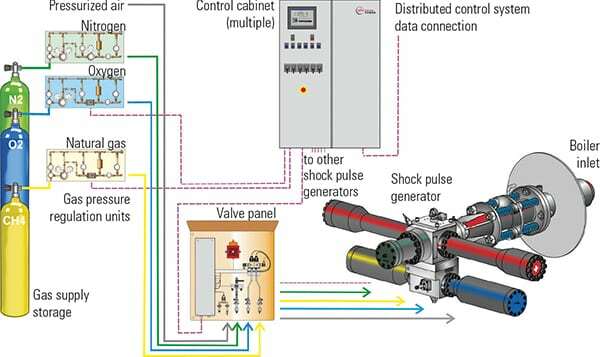 Shock pulse generators (SPGs) are an innovative and efficient way to manage boiler cleanliness. SPGs—developed and produced by the Swiss company Explosion Power GmbH—are online boiler cleaning devices that produce automated shock pulses through the ignition of pressurized gas mixtures. The area of application covers various steam generator designs and a variety of solid fuels. 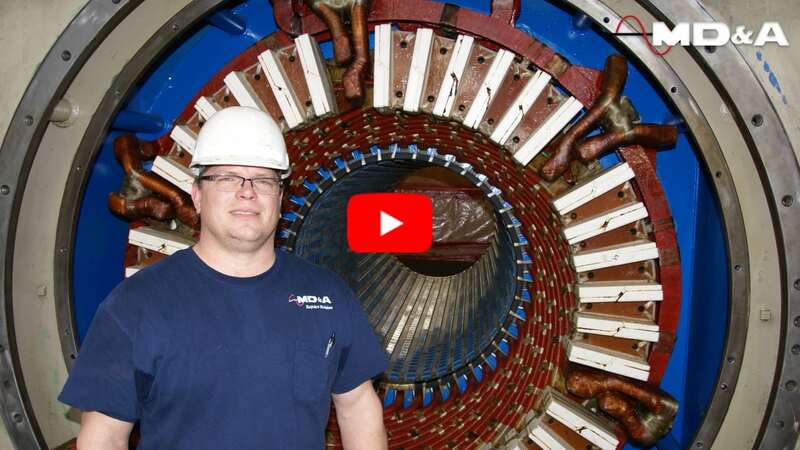 SPGs can thereby be utilized from the combustion chamber/first pass—the hottest zone of the steam generator—through the radiation and contact passes, up to the coldest steam generator zones in the economizer. Plant operators have confirmed significantly longer uptime for steam generators, higher efficiency, and longer operational lives for the steam generator tubes, resulting in a sustainable and economic plant operation. Some leading plant suppliers have chosen to install SPG technology in new plants in order to additionally benefit from the equipment’s modular system configuration and compact design. ■ SPG mounted on the steam generator wall. ■ Control cabinet connected to the distributed control system (DCS). ■ Pressure control stations, which reduce the gas cylinder pressures of the natural gas/methane (CH4), oxygen (O2), and nitrogen (N2) to 40 bar (580 psig). ■ Valve panel installed as a pre-assembled module. With SPGs, the automatically triggered combustion reactions take place outside of the steam generator in a stable, pressure-resistant container, and the generated pressure wave is passed through a convergent-divergent nozzle into the steam generator. The pressure wave generates a structure-borne sound oscillation within the caking and sets the flue gas flow and the heating surfaces into a short-term vibration. Soot buildup is efficiently cleaned away through these simultaneously occurring effects. 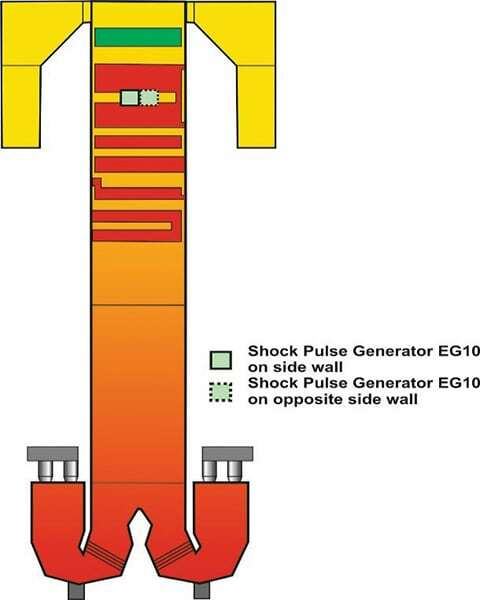 The penetration depth of the shock wave depends on the type of device, but it can be more than 10 meters (m). During its waiting time, pressurized nitrogen holds the freely moving piston forward in the SPG, sealing the outlet gas-tight. After being enabled by the controller, the dosing container is filled to the set pressure with the necessary small amounts of natural gas and oxygen. At this point, the two gases are still completely separated from each other and are therefore noncombustible. The transfer solenoid valves for natural gas and oxygen open, and the two gases flow into the combustion cylinder, where they mix with each other and become combustible. The glow plug is energized, triggering combustion. Due to the sudden pressure increase in the combustion chamber to 350 bar, the piston shoots backward, opening the outlet. The pressure wave passes through the outlet nozzle into the steam generator and spreads out—initially linearly and then spherically. After the pressure wave has left the unit, nitrogen pressure pushes the piston forward, closing the outlet. A waiting period follows, which can last for several hours. The SPG can be mounted either horizontally on the steam generator wall (Figure 3) or vertically on the ceiling. Supplying gas to the SPG can be easily accomplished using individual cylinders or small bundles. The piping to the SPG requires only a 12-millimeter nominal diameter and a line pressure of 40 bar. A small compressor can also be used for natural gas with an existing main connection. The generators have been used in existing plants as a replacement or supplement for previously installed boiler cleaning technologies. But another big advantage can be realized in new construction projects. SPGs allow a significant reduction in the enclosed building volume, and thereby the steel required for construction, compared to plants designed with long retractable sootblowers. The cost savings can be substantial. The low construction volume of approximately 1 cubic meter per generator even makes installation in out-of-the-way spaces possible. The Werdohl-Elverlingsen coal-fired power plant in Germany is operated by Mark-E, a subsidiary of the ENERVIE Group. Block E4 has an electrical output of 321 MW. 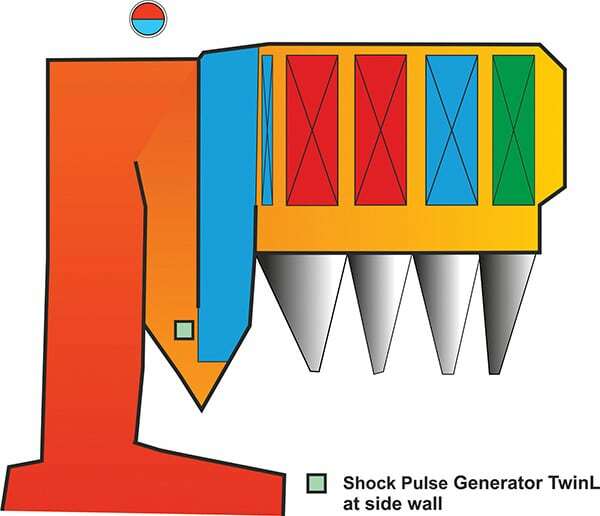 The unit has a Benson steam generator with two chambers and double U-firing (Figure 4). The dimensions of the steam generator are approximately 11 m x 13 m x 80 m.
The plant has been cleaning Reheater 1 using two SPGs since September 2011, and three sootblowers have thereby been shut down. In addition to the steam savings, inspections have shown that the service life of Reheater 1 has been extended considerably, as damage caused by abrasion and erosion have been reduced. Another installation was completed at the Josefstrasse waste-to-energy (WTE) power plant in Zürich, Switzerland. The four-pass horizontal boiler has a radiation pass width of 7.2 m and processes up to 13.25 tons of waste per hour, including up to 15% sewage sludge. The steam capacity is 52 tons/hr at 40 bar and 400C. A membrane evaporation wall subdivides the third radiation pass into a left and a right half. 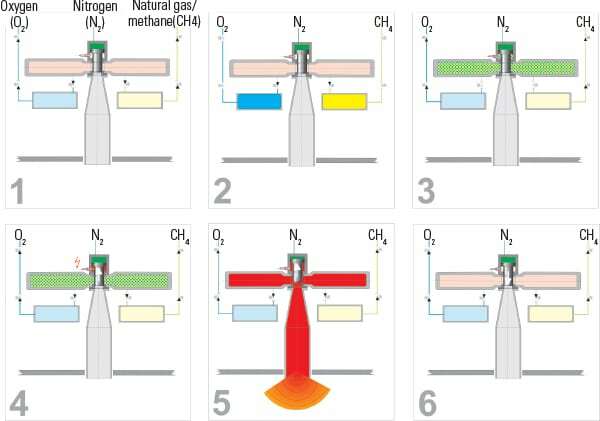 By design, flue gas temperature should not be allowed to exceed 700C at the inlet to the horizontal pass to prevent excessive corrosion of superheater tubes. In 2015, the flue gas temperature at the inlet of the horizontal pass increased during operation almost linearly 7C per day, reaching the critical value of 700C less than one month after boiler startup. 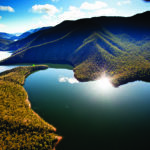 By using a shower cleaning system, the plant could keep the temperature around 700C for two to three weeks. However, in order to avoid a further increase in temperature at that point, a manual online boiler cleaning was required, which in practice reduced the temperature to a similar value as after a maintenance stop. Thereafter, the periods until shower cleaning and manual online boiler cleaning were again necessary became shorter and shorter. One TwinL SPG was installed in 2016 near the lower part of the second radiation pass (Figure 5) to enhance cleaning. The improvement was immediately noticeable. The SPG was commissioned one week after boiler startup. During weeks two and three, the interval between shock pulses was four hours. During weeks four and five, the interval decreased to two hours, and from week six onward, pulses were required every hour. Although the flue gas temperature at the inlet to the horizontal pass increased in the first month to 600C, it was then maintained between 600C and 650C for the rest of the four-month operating period through use of the SPG. Not only did the reduced flue gas temperature decrease the corrosion rate in the superheater bundles, but the operator also noticed positive effects in the manual online cleaning regimen necessary in the horizontal pass. It could be reduced from three interventions to one intervention every six months of operation. Additionally, sand blasting during the maintenance stop could be carried out faster and with less material disposal required. Last, but not least, the reduction in the flue gas temperature allows overload operation of the boiler during periods of peak demand in the district heating system. 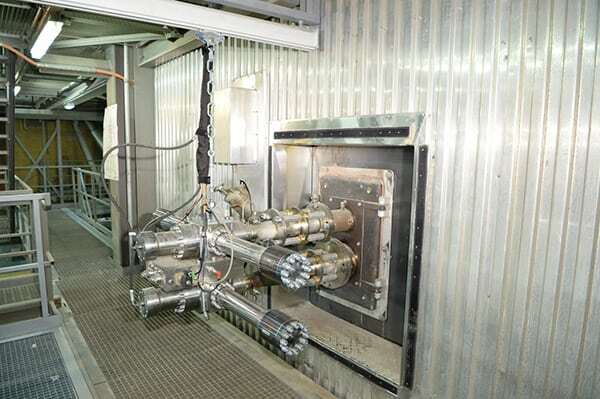 “The shock pulse generator enables us to run our district heat production on maximum performance all year long,” said Bernhard Dettwiler, managing director of the Josefstrasse Waste Incineration Power Plant. —Christian Steiner is deputy chief sales officer and Kaspar Ninck is sales engineer for Explosion Power GmbH, headquartered in Lenzburg, Switzerland.